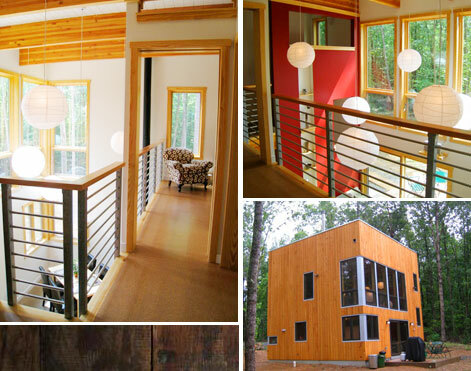 This is the Cube House, designed and built by Tom and Yumiko Virant of Virant Design. You may remember this savvy duo from a previous post and see a few similar elements in their fabulous work. The home is situated just south of Charlottesville, Virginia and takes the shape of a cube, 24 feet on each side (with a couple bump outs for bathrooms, the entry way and a second floor closet.) It also has a roof deck. I love Tom's description of how they pick the right place to build, "We find the prettiest place on the lot, then build somewhere else!" They didn't start out creating a cube but as Tom explains, "It just naturally leaned towards square and the height was so close that we just decided to go with it and make it a perfect cube." The house was built for Alison Threatt, a close friend of Yumiko's. When approaching the design, Yumiko wanted the space to feel open, light, quiet and peaceful. With a lean budget of just $150,000, they created a 1000 square foot space that wouldn't feel cramped or uncomfortable. Allowing in much light and forgoing any window treatments was one way to achieve this mission. Yumiko adds, "There are openings on the different stair landings so that you can get a different perspective of the house when you are changing levels. The house feels bigger than it is because you always feel like you can go somewhere and have a different perspective of the space." It was very important that the space felt connected to the outside. When I asked Tom what he loved most about the house he spoke of the view, "I love the window placement and direct view of the outside woods from every location in the house." The exterior evokes curiosity as well. As Yumiko explains, "I love that the unusual form is a bit mysterious from the outside. I think it makes you want to go inside and see what's going on in there." The paper lanterns are Yumiko's favorite feature and they were just a few dollars each from IKEA. Combining more than one lantern offered a powerful perspective. Yumiko explains, "I think of them as being alive. They move slightly on their own because of the natural movement of air. I think of these as your friends when you are in the house. You can see them from every room and they are also quite beautiful from the outside at night."